STRIKES ARE TO take place outside almost 40 Lloyds Pharmacy stores in Ireland today, despite the company agreeing on a new deal with staff. Lloyds Pharmacy yesterday issued a statement outlining it has agreed a new deal with staff which delivers pay increases, additional benefits, the implementation of banded working hours and a voluntary severance packages. The deal, it said, followed negotiations with its employee negotiating body, the Colleague Representative Committee (CRC). Lloyds Pharmacy, which employs more than 1,000 people at 90 Irish stores, doesn’t recognise Mandate and told the Labour Court it deals with issues around employment terms and conditions through CRC, Fora reported. In its statement yesterday, Lloyds Pharmacy said pay increases for all staff range from 1.5% to 11% and that no staff member will now be on less than €10.60 per hour. The company has called on Mandate to withdraw its threatened strike action for this weekend and future months. “Further strike action is reckless and threatens the secure platforms we have established for the business,” Lloyds Pharmacy director of sales and marketing Pat Watt said. 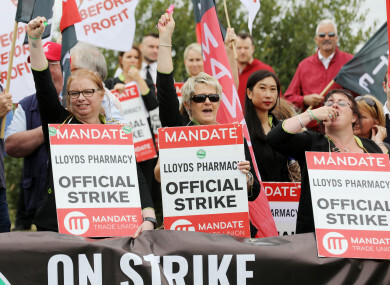 Despite Lloyds Pharmacy announcing a new pay deal, David Gibney, communications officer at Mandate told TheJournal.ie that a planned strike today will still go ahead. “[The new deal] is not sufficient. The terms and conditions that the CRC… negotiated are significantly below where our other members in pharmacy outlets are,” Gibney claimed. “[Today] we’re on strike. We’ve announced the next three days of strikes. We’re going into consecutive days,” he said. We don’t want to be on strike, our members don’t want to be on strike, all we want to do is sit down and negotiate on behalf of our members. Mandate yesterday issued strike notice to management at Lloyds Pharmacy for nine days of industrial action in September, October and November. The future strike dates include 3 and 4 September, 1-3 October and 1-5 November. A full list of stores striking today can be found here. With reporting by Adam Daly. Email “Lloyds Pharmacy workers at almost 40 stores to strike today despite company agreeing new deal”. Feedback on “Lloyds Pharmacy workers at almost 40 stores to strike today despite company agreeing new deal”.